The battleship Bretagne was the type ship of the class of the same name, which consisted of three dreadnought battleships and was completed during the First World War. After building the Courbet class battleships, the French Navy decided to build more but more heavily armed dreadnought battleships to modernize and expand the navy. 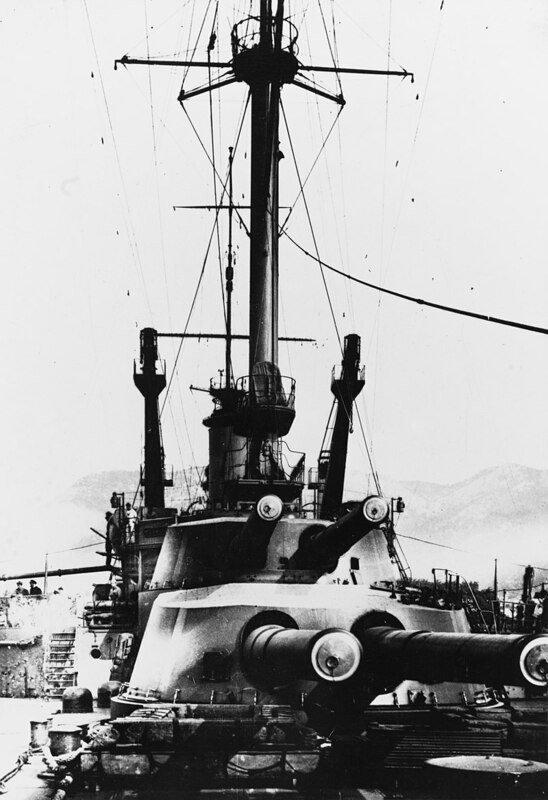 The calibres of the main guns were no longer the 30,5 cm guns already used, but 34 cm guns to be able to draw level with the new battleships Great Britain and the German Empire. For the construction of the ships, however, the dimensions were tied to the size of the docks of the French shipyards. So the dimensions of the ships should be the same as those of the Courbet class and thus a length of 166 meters and a width of 27 meters should amount to. In order to be able to carry the new, larger and thus heavier guns, they had to be moved closer to the bow and stern of the ships, which ensured stability but reduced seaworthiness. A total of 10 Canon de 34 cm Model 1912 guns were used in 5 twin turrets. Two of the turrets were at the front and two at the back of the ship, the last turret was located in the middle of the ship and should be able to cover both port and starboard. As middle artillery 22 x 138 mm cannons were used, which were accommodated in single towers along the hull. On each side 2 x 450 mm torpedo tubes were used for the attack and it was possible to carry up to 28 naval mines and to lay them as a barrier. Similar to the Courbet class ships, the waterline belt was heavily armoured to protect the ship against attacks by submarines and their torpedoes, but the Brittany class armour was only up to 250 mm thick, the Courbet class up to 270 mm. The turrets of the main guns were protected by 300 mm thick armour plates, the middle artillery by 160 mm thick plates. The construction of Bretagne began after the order on 1 May 1912, the launch on 21 April 1913 and the commissioning on 29 November 1915. After the commissioning and the following test runs the battleship Bretagne was officially handed over to the fleet on 10 February 1916 and assigned to the 1st fighter squadron. 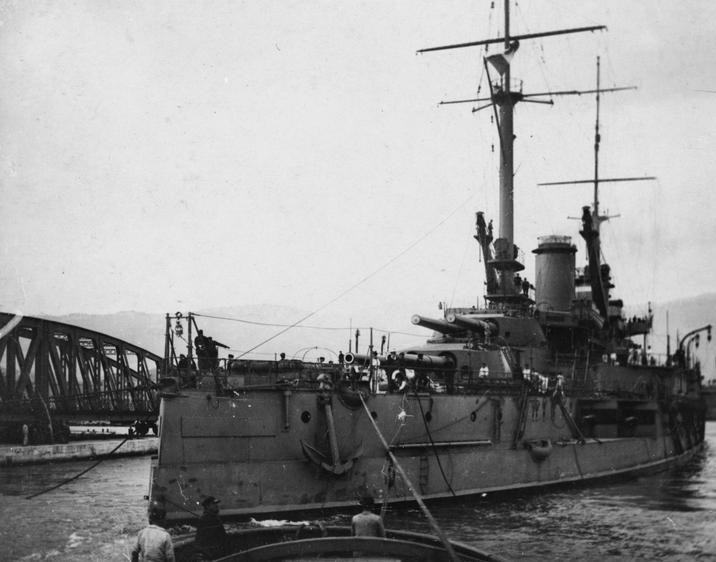 At the time of the introduction of the ship Italy had already joined the war against Austria-Hungary at the side of the Allies and had taken over most of the security tasks off the coast of Austria-Hungary, so that the French fleet patrolled only the southern part of the Mediterranean Sea. After the port of Argostoli on the Greek island of Kefalonia could already be used from 27 April 1916, the Greek island of Corfu was added at the beginning of 1917 as a base for the French warships. However, already from 1917 the lack of coal showed up, so that the battleships only rarely left the port, Bretagne remained even the whole year in the port. In 1918, the shortage of coal continued to make itself felt, so that the ships remained in the port. However, this time was used to modernize the battleships, especially for the exchange of smaller guns. 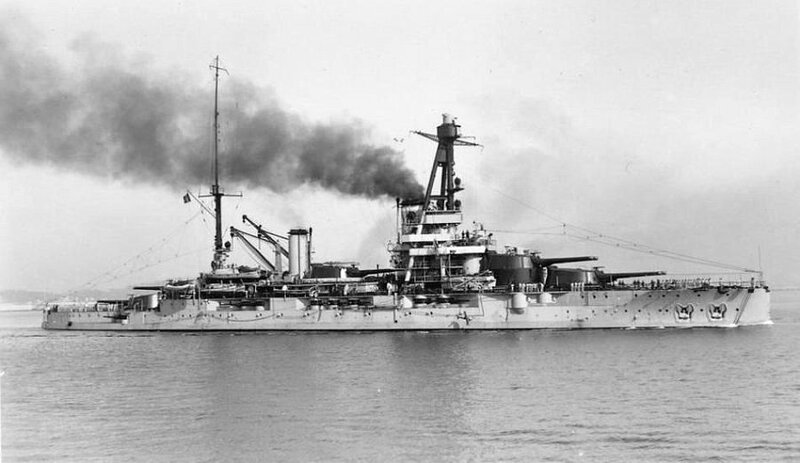 After the armistice in Europe and the surrender of Austria-Hungary, the Ottoman Empire and the German Empire, the battleship Bretagne returned to its home port of Toulon. In the period from 12 June 1919 to 18 October 1920 some modernisations were carried out in Bretagne. These included increasing the range of the main guns, replacing the 75 mm anti-aircraft guns with more modern ones and adding some rangefinders. After the modernisation measures were completed, Bretagne was put back into service on 6 June 1921 as the flagship of the Mediterranean fleet. 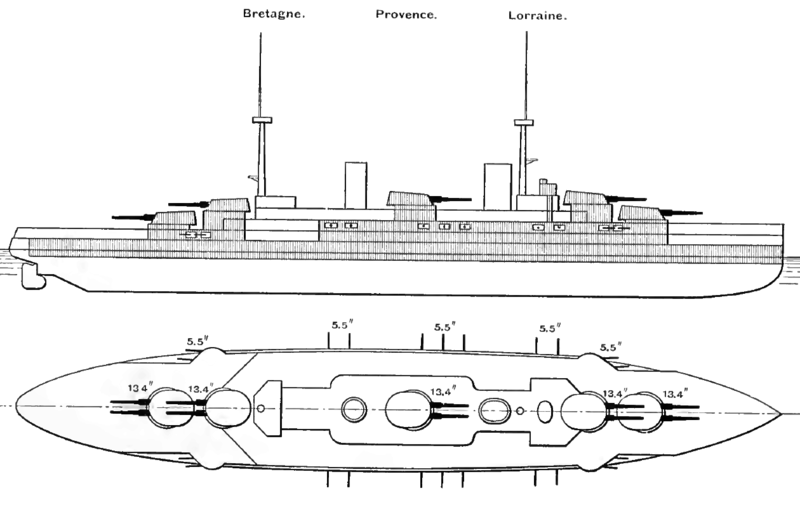 Several manoeuvres and round trips followed until Provence replaced Bretagne as flagship on 1 September 1923. From 1 May 1924 a longer stay took place in the shipyard during which modernisation measures were again carried out. Again the main guns were adapted and the range increased. In addition a part of the armour at the bow of the ship was removed which should improve the ability to sail at higher speeds. Furthermore, some of the coal-fired boilers were replaced by oil-fired boilers. On 28 September 1925 the work was completed and Bretagne was again used as the flagship of the Mediterranean fleet. In the following years the ship switched between round trips, manoeuvres and modernisations. By 12 November 1934, the fire control system, rangefinders and armament had been replaced or supplemented. Also the remaining coal boilers were replaced by small oil boilers, so that a boiler room could be converted into a bearing for oil. On 11 May 1935 the three ships of the Bretagne class were merged into the 2nd division. France felt more and more threatened by the up-and-coming National Socialist Germany, so that already in the middle of 1935 it was begun to work out operational plans for the French army and the navy. The 2nd Division was therefore stationed permanently in the home port of Brest and was to be further expanded to intimidate Germany. 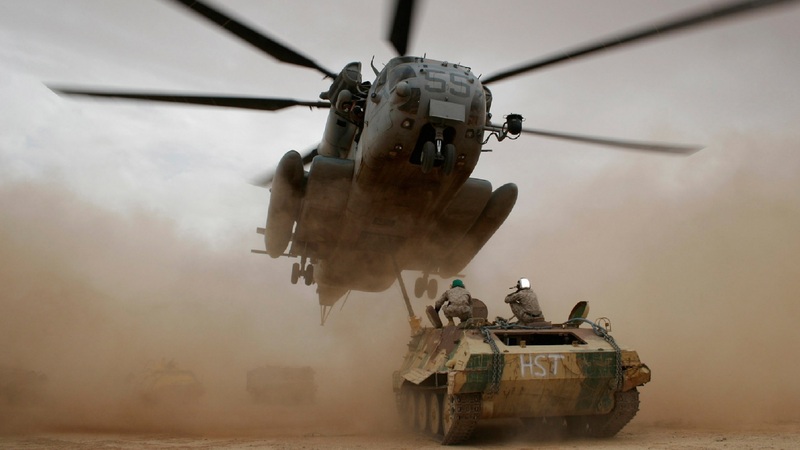 After some joint manoeuvres the division was transformed into the Atlantic Squadron on August 15, 1935. Travels to the Azores, Madeira, the Portuguese Cape Verde and the French Morocco followed to demonstrate strength. On June 10, 1939, the squadron was transferred back to Toulon in the Mediterranean Sea. After the outbreak of the Second World War in Europe, Italy initially remained neutral, so that neither France nor Great Britain had to deploy their warships in the Mediterranean in major operations. From September 1 to October 5, 1939, Bretagne and its sister ships Provence and Lorraine nevertheless accompanied troop transports between North Africa and France. After an unsuccessful search on 4 December 1939 for a German trade troublemaker, Bretagne was again overtaken in Toulon, which lasted until 3 March 1940. On March 11, 1940, the ship brought 1,820 gold bars from the French treasury to Halifax together with the heavy cruiser Algérie, which also carried 1,179 gold bars. On the way back to Toulon 2 American merchant ships with 82 bought airplanes were accompanied. At the end of April 1940 the squadron was transferred from Toulon first to Algiers and then to Egypt. After an invasion by the German Wehrmacht and a war with Italy became more and more probable, the French High Command decided to collect its battleships in the western Mediterranean area and to prevent thus with a war with Italy their fleet from a departure, as it was already accomplished with the fleet Austria-Hungary in the first world war. Thus Bretagne and its sister ship Provence left the Egyptian Alexandria on 20 May 1940 and reached Mers El Kébir on 27 May, where other French battleships were already anchored. After France had to capitulate on 22 June 1940, the French fleet, if it had not yet been interned in Great Britain, was placed under German administration and was either to be disarmed or transferred to Vichy France. British Prime Minister Winston Churchill feared, however, that the German navy would take over the French ships and use them against Great Britain. He ordered to take over the French warships in the British ports. The ships, which lay in the ports of the French colonies, were to be either handed over or destroyed. The French warships at Mers El Kébir received an ultimatum for delivery from the British warships outside the port on 3 July 1940. The French captains allowed the ultimatum to expire and the British warships opened fire. During the battle, Bretagne received a total of 4 hits from the ships Hood, Resolution and Valiant. The first hit was at one of the main guns, which led to an explosion and water ingress. The second hit destroyed parts of the engine room, causing the ship's energy to be interrupted all at once. Shortly thereafter, hits three and four followed, with one of the grenades hitting ammunition from the main guns and causing them to explode. Around 17:09 on 3 July 1940 there was a major explosion on the ship, the ship began to spin and then capsize. A total of 1,012 crew members died in the attack. From 1952 to 21 December 1954 the wreck was scrapped in the port.